This before photo shows that – as with many older homes – the house didn’t make anything of its garden outlook. 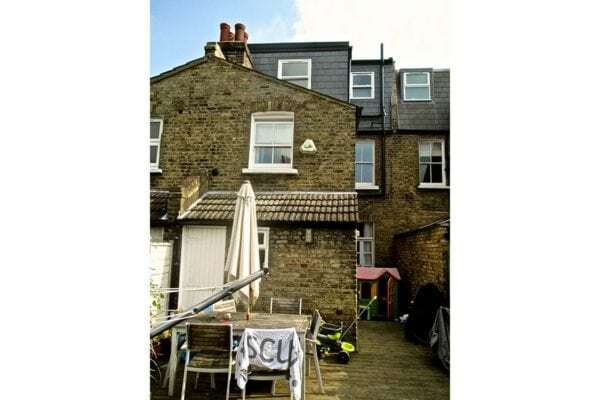 Also, in common with other Victorian terraces, it had an under-utilised side return. Building into this passageway was key to the success of the extension design. The extension roof is a gable design, with a fixed glass panel above the bifolding doors to increase the light. “More, though, it accentuates the height of the room, because the eye is drawn to the full height of the ceiling due to the outside aspect,” Bernard says. Bifold doors were fitted across the back of the new extension. “They allow maximum connection from inside to out, and that was extremely important, as the owners wanted to enjoy entertaining in the garden,” Bernard explains. Bernard opted for a level threshold between inside and out and laid textured floor tiles in both areas. The garden is laid with easy-care artificial turf. The garden seating area is at the end of the plot on the right, as this is the spot that gets the most natural sunlight. Zoning the cooking, eating and relaxation areas of the open-plan space effectively was vital. “The owners liked the idea of keeping the cooking zone in the darker area of the space, because all the artificial lighting that comes with the kitchen brightens it up,” Bernard says. The living area is in the naturally lit zone at the back. See the project details here.